As you get older, birthdays can get pretty lame, even depressing. But imagine if you had to experience the same one over and over again, Groundhog Day style, and you kept dying at the end of it like Edge of Tomorrow? That's what happened to college student Tree Gelbman in Blumhouse's horror hit, Happy Death Day, and while she got out of it last time, apparently it's about to start all over again. 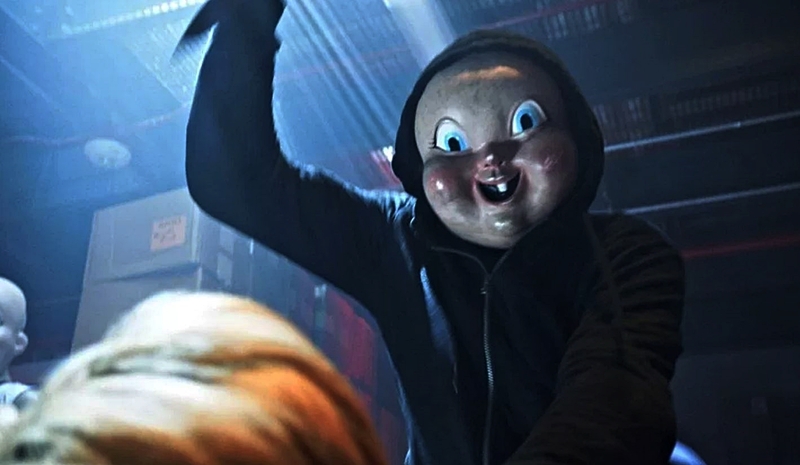 The first trailer for sequel Happy Death Day 2U is here, and murder is coming back for a second helping. Jessica Roth is back as Theresa aka Tree, who was pretty self-centered in the first movie which saw her repeatedly murdered by an unknown masked killer. Now Tree has improved herself and moved on with her boyfriend Carter (Israel Broussard), but it looks like her problems are just beginning. Also returning is Ruby Modine as Lori, which will be surprising to those familiar with Happy Death Day. Then again we're talking about time loops and stuff so technically anybody from the prior could return, right? Christopher B. Landon is back as director and he's also writing the script, taking over from former Uncanny X-Men writer Scott Lobdell. Kinda shocked Lobdell didn't come back, but Landon is obviously familiar with the material and has previous writing experience from the four Paranormal Activity movies he penned. New faces to the cast include Sarah Yarkin and Life of Pie's Suraj Sharma. Happy Death Day 2U opens February 14th 2019.